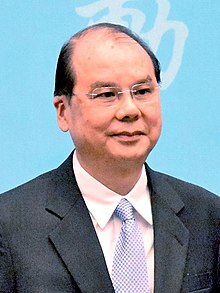 The Chief Secretary for Administration (Chinese: 政務司司長), commonly known as the Chief Secretary of Hong Kong, is the most senior principal official of the Government of the Hong Kong Special Administrative Region. The Chief Secretary is head of the Government Secretariat which oversees the administration of the Region to which all other ministers belong, and is accountable for his or her policies and actions to the Chief Executive and to the Legislative Council. Under Article 53 of the Basic Law, the position is known as "Administrative Secretary". The Chief Secretary formulates and implements government policy, gives advice to the Chief Executive as a member of the Executive Council, and is responsible for managing the Government's relationship with the Legislative Council and drawing up the Government's legislative programme. The office also exercises certain statutory functions, such as the handling of appeals from designated public bodies. Prior to the transfer of sovereignty of Hong Kong in 1997, the office was known simply as "Chief Secretary" (Chinese: 布政司; Cantonese Yale: Boujingsī), and before 27 August 1976, "Colonial Secretary". Until the introduction of the Principal Officials Accountability System in 2002, the Chief Secretary was a civil service position, and in this capacity, the head of the public service. In 2005, Henry Tang became the first person who has not been a civil servant to be appointed to the office of the Chief Secretary. From the 1870s to 1902 the Colonial Secretary was the de facto Lieutenant Governor of Hong Kong which was once held by the Commander of British Forces in Hong Kong before 1870s when the post was not lapsed from power. After 1902 the title disappeared from use as the second highest post was transferred to the Colonial Secretary and later, Chief Secretary. ^ Resigned on 25 May 2005, with effect from 1 June 2005, Michael Suen served as acting Chief Secretary between 25 May to 30 June 2005. ^ Resigned on 28 September 2011, with effect from 30 September 2011, Michael Suen served as acting Chief Secretary between 28 to 30 September 2011. ^ Resigned on 12 January 2017, with effect from 16 January 2017, Matthew Cheung has served as acting Chief Secretary from 13 to 16 January 2017. Victoria House, 15 Barker Road, Hong Kong. The Chief Secretary resides at an official residence at 15 Barker Road, The Peak, Hong Kong, which is also known as Victoria House and Victoria Flats. Choa, Gerald H. (2000). "Appendix II: Colonial Secretaries of Hong Kong, 1843–1912". The Life and Times of Sir Kai Ho Kai: A Prominent Figure in Nineteenth-Century Hong Kong (2nd ed.). Hong Kong: Chinese University Press. p. 274. ISBN 978-962-201-873-0. OCLC 44267286. ^ "Remuneration package for Politically Appointed Officials serving in fifth-term HKSAR Government". Hong Kong Government. ^ a b c "Colonial Secretary (Change of Title) Notice 1976 L.N. 226 of 1976". Regulation of Hong Kong 1976: B1109. 25 August 1976. ^ Roberts, Denys (18 April 2006). Another Disaster: Hong Kong Sketches. The Radcliffe Press. ISBN 9781845111120. ^ "No. 20315". The London Gazette. 9 February 1844. p. 442. ^ "No. 20709". The London Gazette. 26 February 1847. p. 834. ^ "No. 21635". The London Gazette. 1 December 1854. p. 3909. ^ "No. 23353". The London Gazette. 18 February 1868. p. 772. ^ "No. 27423". The London Gazette. 8 April 1902. p. 2334. ^ Clementi, Cecil (1912). "General Observations" (PDF). Hong Kong Annual Report (1911). p. 24. Retrieved 5 October 2014. ^ "Death of Mr. W.D.Barnes". The Straits Times. Singapore. 30 October 1911. p. 7. Retrieved 3 October 2014. ^ a b "No. 134 of 1958". Hong Kong Government Gazette Extraordinary. 100: 223. 24 January 1958. ^ "No. 716 of 1959". Hong Kong Government Gazette. 101: 1360. 29 May 1959. ^ a b "G.N. 469 of 1963". Hong Kong Government Gazette Extraordinary. 105: 629. 13 March 1963. ^ "G.N. 733 of 1965". Hong Kong Government Gazette. 107: 1012. 26 March 1965. ^ "G.N. 2159 of 1965". Hong Kong Government Gazette Extraordinary. 107. 4 September 1965. ^ "G.N. 146 of 1969". Hong Kong Government Gazette. 111: 168. 24 January 1969. ^ "G.N. (E.) 10 of 1969". Hong Kong Government Gazette Extraordinary. 111: 9. 29 March 1969. ^ "G.N. 2559 of 1973". Hong Kong Government Gazette. 115: 3839. 3 October 1973. ^ a b "G.N. 2536 of 1978". Hong Kong Government Gazette. 120: 2887. 6 October 1978. ^ a b "G.N. 3410 of 1981". Hong Kong Government Gazette. 123: 4156. ^ a b "G.N. 1875 of 1985". Hong Kong Government Gazette. 127: 2626. 14 June 1985. ^ a b "G.N. 440 of 1987". Hong Kong Government Gazette. 129: 667. 13 February 1987. ^ a b "G.N. 440 of 1993". Hong Kong Government Gazette. 134: 6073. 3 December 1993.